In 2013 we decided to spend the summer living in the vineyard. We had a trailer to sleep in, a giant garden, 6 chickens (for eggs,) and my husband was tending the vines. 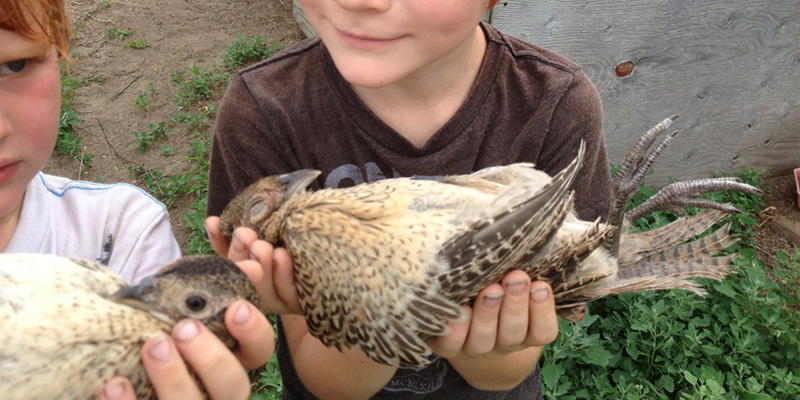 On top of that we had about 25 pheasant chicks to raise. We planned to harvest some for meat and some we would set free. * I was trying so hard to be a good mother to these fluffy orphan foul. I drove miles and miles to get thee most wild pheasant diet-appropriate feed with no corn, soy, or antibiotics. The kids and I held and played with them as well as kept their spacious area free of filth. We didn't name any of them because we knew their ultimate fate. So when it came to the day of harvest I knew we could not waste one bit of these birds. Most pheasant hunters only breast the birds and dispose of the rest. We were not going to be this wasteful. Carefully we removed the livers that were used for pate, the gizzards that would be sautéed, and the breasts were separated from the bottom half. Instead of throwing the legs/backs in the bin, we vacuum packed them and put them in the deep freeze where I could avoid them for some time. I was told that the bones are many in pheasant legs and surrounded by so much connective tissue that it's very difficult to get to the meat. Nonetheless one day I gave it a go. So much frustration to get such a small amount of protein! So they continued their deep cryostasis until the day I was at Lenny Russo's Heartland deli in Lowertown. There in the fridge case was the answer to elevating these tiny legs with tiny bones. Duck Confit! Heartland even carried the duck fat that would gently cook them to falling off the bone perfection. A few google searches and I learned I could make this traditional French dish in my slow cooker. Easy peesey. I made minor tweaks to this recipe, and the result was amazing. The legs become so rich you won't want to serve it with anything too fatty or starchy. I suggest a crisp romaine salad and a small side of sweet potato, beet salad, or wild rice. More often these legs wait in the fridge to be picked on for quick snacks. The fatty preparation acts as sort of a preserving layer so they can be taken along on hikes or popped into lunch without need to be kept cool or to be heated before consumption. If the legs you start with have the skin on you can keep it on and remove it when they come out of the slow cooker. From there I put the skin on a sheet pan and crisp it up under the broiler. Everything gets used and everything tastes amazing. Any poultry legs (thigh and drumstick) will do- pheasant, turkey, chicken, and of course duck. The ones in the picture are chicken from Kadejan that I bought at the Wedge. They are "treated and handled humanely from chick to chicken" and raised without antibiotics. I try to buy as little meat as I can that didn't get to live a full life in the wild. This is a value and a preference. Over time I have found that wild meat has more flavor and better texture. Eat Wild Minnesota is a good resource for finding meat raised under very high, humane standards. This is a printable pdf. *Look, I know this is a delicate subject for some. If you are vegan or vegetarian for ethical reasons there is nothing I can say to defend my position. If you do eat meat ever and still think raising and harvesting animals is cruel, remember that it is your responsibility to choose from where your meat comes. When you eat meat that had a great life you are taking dollars out of the pockets of the factory farms whose only thought is $$$, not animal or human welfare.